Until relatively recently, individuals who were concerned about the state of the environment were considered to be “tree-huggers”, eccentric, alarmist or even radical. Nowadays, we are bombarded with images, articles and stories which serve to constantly remind us and make us more aware of the impact the human race is having on our planet. Our glorious oceans cover seven tenths of our planet and have, without doubt been impacted by humans over the centuries. Not only do our oceans serve as our pantry, our lungs, our medicine chest, our transport system and playground, they also serve as our waste disposal mechanism. For such a valuable resource, our blue planet has all too often been over exploited and neglected. Such neglect and mistreatment is often out of sight, out of mind. Divers are a privileged minority, who get to witness, first hand, our underwater world and the importance it has on the health of our planet. This privilege and first hand knowledge and experience arm us with some powerful tools to make a difference for the future of our oceans and our planet. As divers, we have an obligation to remind everyone of the fragility of our oceans and how they serve as a litmus test indicator for the overall health of our planet. So where do we start? Often, saving the planet sounds like an almost impossible task of daunting proportions, the result being that nothing is done as it is all too difficult for an individual. The answer is that individuals can make a difference starting in their own back yard – yes, marine conservation starts at home. As divers, we only spend a fraction of our lives underwater, it is therefore on our surface intervals that we can make a difference. Lets start with the basic principles of reducing, reusing and recycling. It is estimated that in excess of 100 million tonnes of plastic is produced every year, of which 10% ends up in our oceans. Findings on the Eastern Pacific Garbage Patch report an area of plastic waste up to twice the size of Texas, circulating in the currents of the Pacific Ocean. In excess of 100,000 marine mammals and sea turtles are killed each year by ingesting such plastic. You can reduce the amount of plastic that you use. Ask yourself, do I really need to buy those pre-prepared ready meals that have all that packaging? Do I have to drink bottled water? Do I need to get all those plastic bags every time I visit the supermarket? Other ways of reducing your impact on the planet include asking yourself do I really need to use the car for that journey? Can I walk, catch public transport, car share or ride my bike to work instead? Can I buy seasonal local produce rather than imported non-seasonal food? Are there environmentally friendly alternatives such as natural cleaning products? My late grandmother and no doubt the rest of her generation was a great advocate of reusing items. Containers can be re-used, left over food can be re-heated or recycled into other delicious dishes. We can all certainly learn a lot from the older generation rather than the throwaway, fast food generation of today. As a diver I have built up an impressive stock of dive gear over the years. When something breaks, rather than simply throw it away, keep it for spare parts. If you cannot reduce or reuse it, you should, if possible, recycle it. Many local councils have free kerbside recycling collection services. 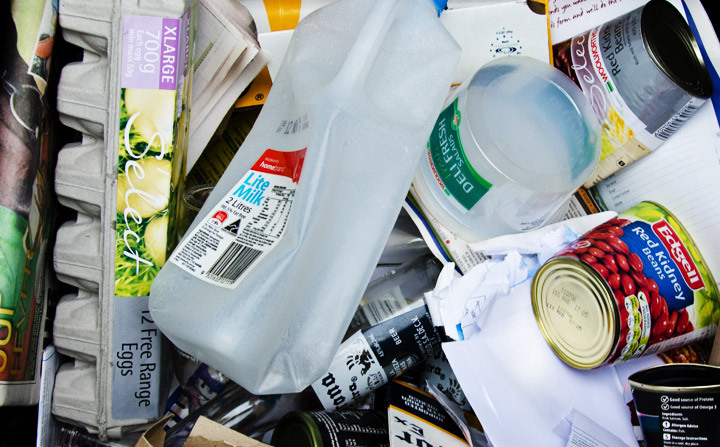 Check out http://recyclingnearyou.com.au for a full range of recycling services and facilities in your local area. It never ceases to amaze me how few of the residents on my street appropriately utilise their green wheelie bin service, so please do your thing, it takes very little effort. What else can I do to save the planet? So, aside from these basic back yard environmental principles, what else can divers do? As divers, we clearly have an impact on our marine environment. We should all learn to dive responsibly, as Project AWARE’s slogan goes, “take nothing but photos, leave nothing but bubbles.” Let us not, however, loose sight of the larger issues. Even if we dive and interact with our marine environment responsibly, we should ensure that we do not exhibit double standards. I find nothing more contradictory than seeing divers behave responsibly in the water to later see them tucking into a plate of imported prawns. It is important that we, as divers, educate ourselves to the impacts of overfishing and carbon emissions. Knowledge is, after all, power. Industrial fishing is sweeping our oceans clean. Target species are in rapid decline and the level of by-catch from non-target species is astronomical. Shark populations are collapsing from both by-catch and shark finning practices. Top predators are disappearing, impacting our ecosystems. The list goes on. Now before I get on my high horse, I, like many others love eating seafood. More and more however, I am becoming increasingly choosy. Contrary to the recommendations of many nutritionists, I have significantly reduced the amount of seafood I eat as I learn more on the impacts and sustainability. For me, seafood is now an occasional treat rather than a weekly necessity. I always buy local fish from sustainable fisheries and avoid many unsustainable choices such as yellowfin tuna, flake (shark) and cod. Aside from seafood, dive travel is arguably a major contributor to the degradation of our oceans. International flights to visit top dive destinations produce a significant carbon footprint. It could even be argued that we are in fact, loving our marine environment to death. I believe that more and more, divers will start to see the link between dive travel, emissions, our carbon footprint and the future of our reefs. Realistically, are we really going to stop travelling for our DiveBuzz? I doubt it. However, perhaps we could consider combining trips and of course offsetting our emissions via contributing to carbon offset schemes on offer. For budget travel, ask yourself what the real cost is? So what are you waiting for? Start today by getting your back yard in order in your attempt to protect our underwater wonderland for the divers of tomorrow. Share your passion, spread the word. Do your bit.